It will be good to wrap up 2015 on Earwigoagin with a much delayed post about the French tall-ship, L'Hermione, the ship that brought Lafayette to America to fight in the American Revolution. The recently completed replica of L'Hermione visited Annapolis this past June and, as with anything nautical, vast crowds descended on City Dock to take a tour. 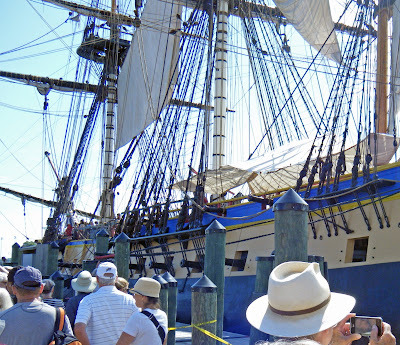 I was one of the throng and even though I got there early enough, it took me close to an hour of snaking back and forth before I could climb the gang plank to board her. 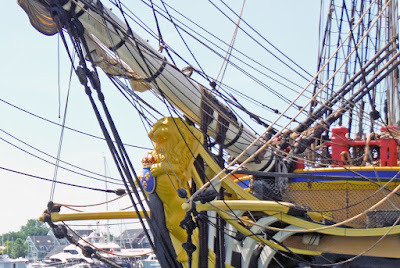 L'Hermione was a middling warship for that era but, up close, she remains today an impressive working monument of the late 18th century. I can't help to imagine what it would have been like to row around a busy anchorage of the 1780's, surrounded by dozens and dozens of tall ships; merchantmen , privateers, warships, and coastal traders. To me, that would be just as stunning a visage as any large cathedral. 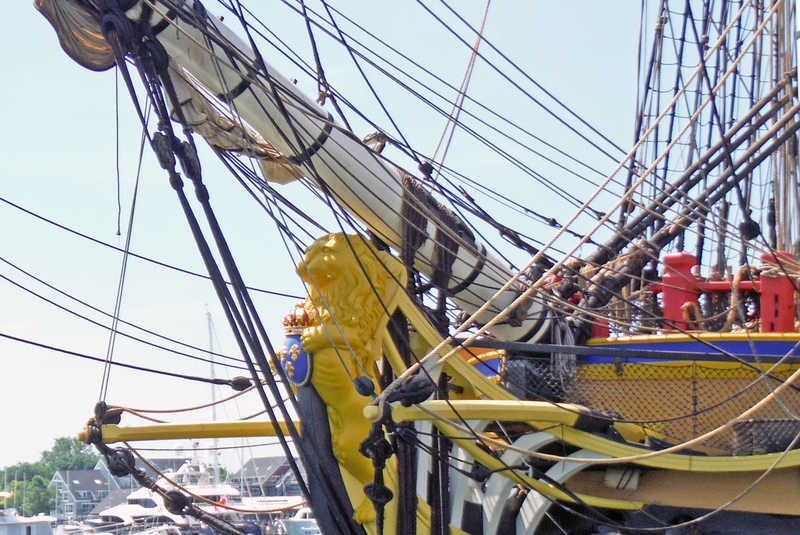 Bonnie of Frogma reported on L'Hermione's visit to New York City (unlike me, she wrote it about it when it happened). Her report can be found here. The line on the home-stretch, within minutes of finally going on board. There was a fellow singing sea-shanties to keep those in line entertained. Given my small boat bent, I was interested in this pair of nesting launches. 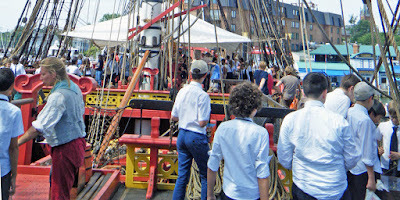 The mast indicated that at least one had a sailing rig. 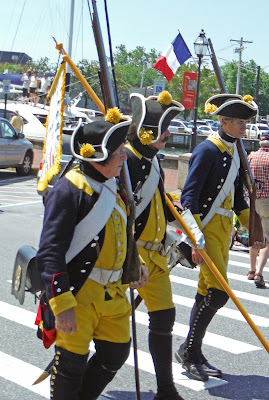 There were plenty of Revolutionary re-enactors milling about including these three in the French army uniform. 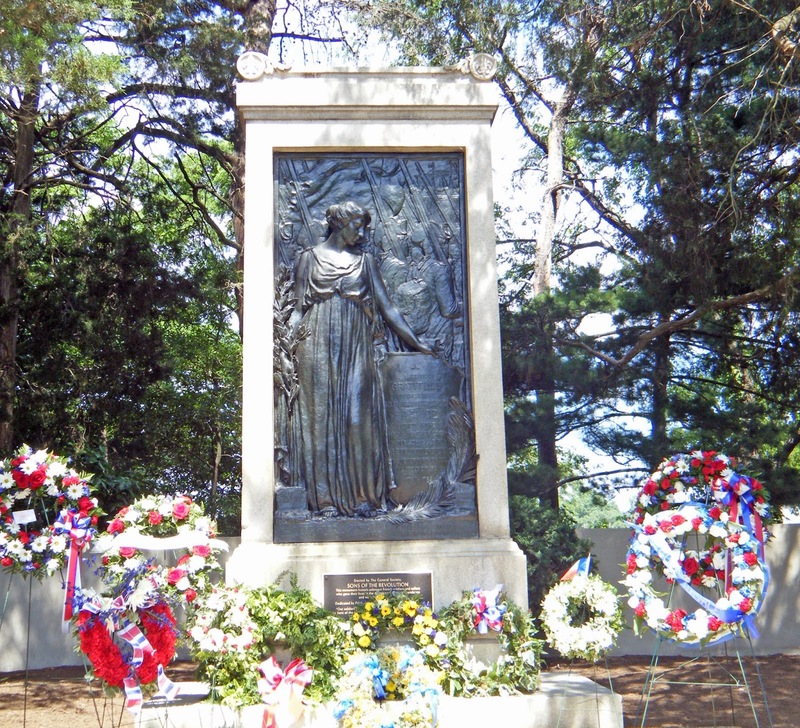 I hadn't realized until reading the local newspaper coverage of L'Hermione's visit that Annapolis has a memorial to the French soldiers and sailors who had died fighting in the American Revolution. It was tucked in the corner of St. John's college, in a copse of pine trees overlooking College Creek, just behind the boat house. After touring the L'Hermione, I took the fifteen minute stroll in the hot June sun, up Pinkney Street, over to Prince George Street, past the Paca House and across the campus, to visit the memorial. The flowers were from a commemoration service that had taken place the previous day, but on this day, I was the only one there. The previous header photo was of the Tempo scow designed by Jack Koper of South Africa in the early 1960's. 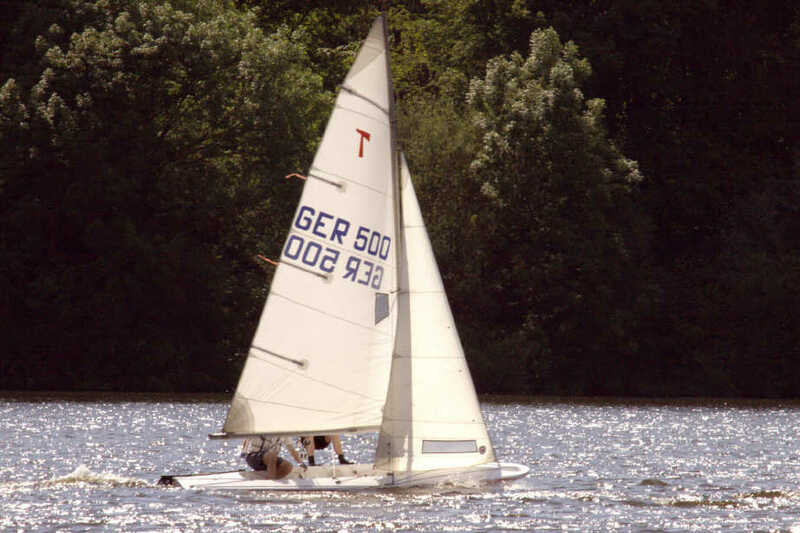 He did three home-built scow designs, all extremely popular in South Africa. The Tempo made it into the northern hemisphere, becoming popular in Germany and Holland and in a twist, the Tempo, in modern times, is now only found in these two countries and not in the home of origin, South Africa. 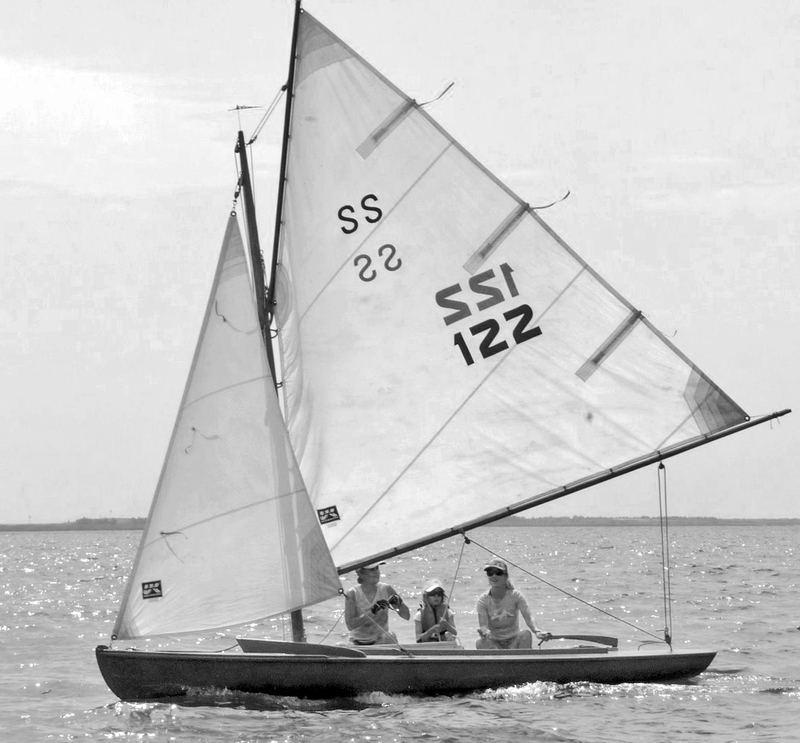 The Fireball was introduced around the same time as the Tempo scow and sits in the same space, a 4.88 meter, two man, single trapeze, spinnaker performance dinghy capable of being home built. The Fireball became an international class, the Tempo is bumping along close to extinction. I hope the Tempo sticks around. 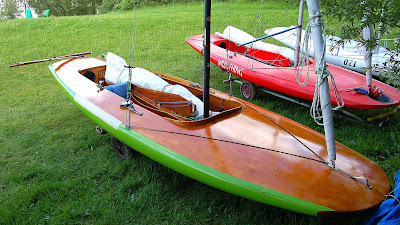 It is a true scow whereas the Fireball is more of an unique transom bowed, flat rocker panel, multi-chine dinghy. 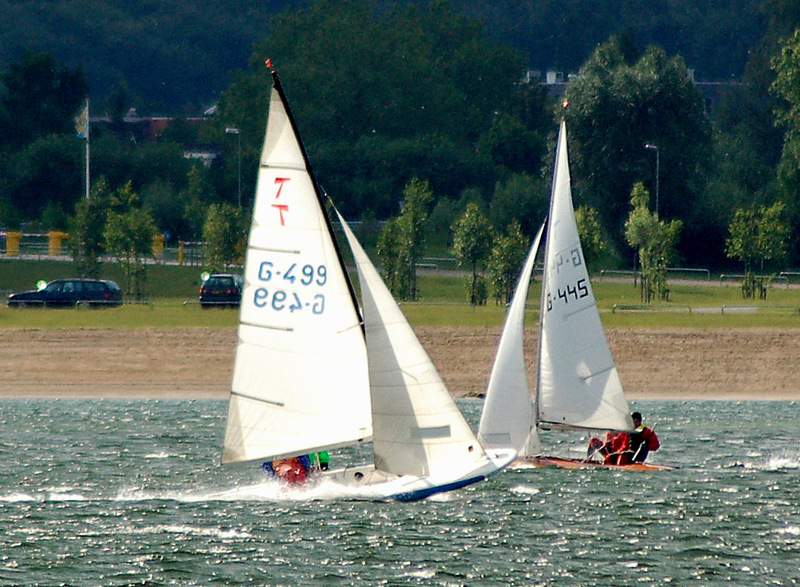 The Fireball, with it's high level of competition, no longer sees a home-built wooden dinghy among the top finishers in a major regatta. It would be nice to see a two man, single trapeze class where a wooden boat still has a chance. It would also be great to see the Tempo plans available as an Internet download. Earwigoagin would offer the services of this blog if someone wants to send the blogmeister a copy of the Tempo plans. A wooden home-built Tempo sitting in front of a fiberglass Tempo. The roundish gunwhale shape was carved out of a solid piece of wood. The history of the Tempo scow. I was frankly surprised to see this small dinghy cruiser at the Sailboat Show. This 12' (3.6 m) mini-dinghy cruiser designed by John Welsford has become the darling of home-builders looking for a small outside, but big inside, simple rig, able-sailing project. This community of boat builders, an alternative universe in the sailing world, revolve around the DIY wood designs of Phil Bolger, Jim Michalak, Ian Oughtred, John Welsford, Francois Vivier and others, And this alternative universe seldom intrudes on the plastic commercial world which predominates at the large boat shows. 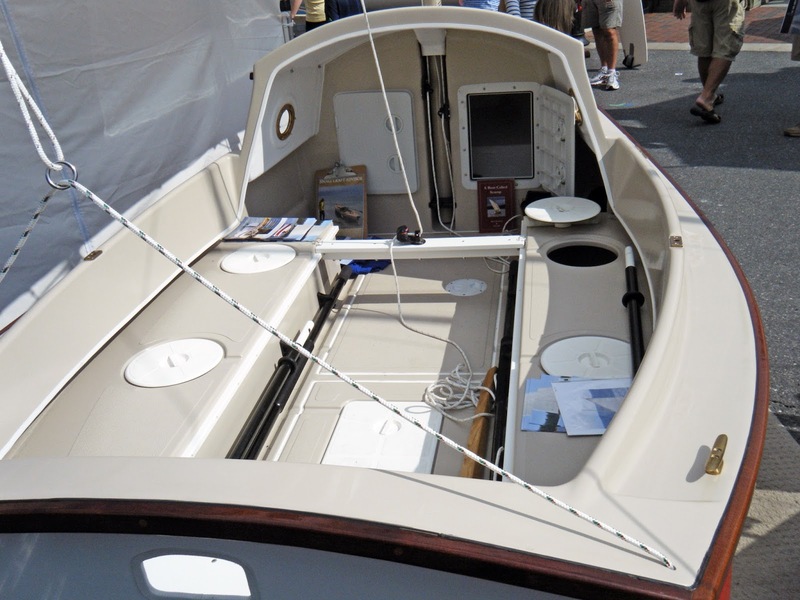 But, in 2015, there she was, a plastic Scamp, built by Gig Harbor Boatworks north of Seattle Washington. There is no doubt this is a clever design. 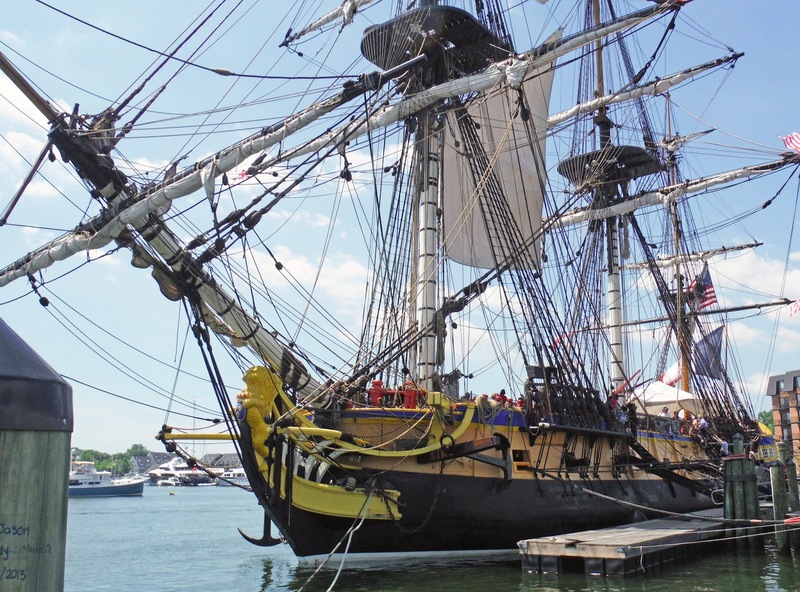 It has a transom bow that tapers rapidly toward the waterline, the actual sections at the bow waterline are V-ish. There is an offset centerboard under the starboard seat. This makes for an unobstructed floor, perfect to lay out a sleeping bag. The Scamp is high sided though the designer has given her a pleasant sheer to make this a jaunty looking dinghy. There is 70 kg of water ballast to dampen down what could be a very lively motion in wind and waves. 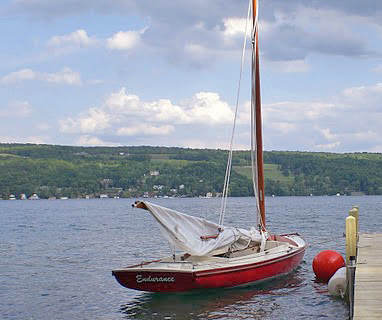 The summer of 2014, I was sitting on the back lawn at my friend Bill M's house, just off South River, when I spotted a small sailing dinghy making her way smartly against a building sea breeze. To settle our speculation about what kind of boat we were watching, Bill promptly went to get his binoculars. Through the binoculars I could tell it was a Scamp (a very distinctive profile with her balanced lug rig) and the skipper was doing a fine job getting her upwind. He poked his nose just into the Chesapeake Bay and then turned downwind to rock and roll back into South River. As a spectator, I was mightily impressed at the Scamp's sailing performance (initially being somewhat of a skeptic when the Scamp first came out). One quibble was the Scamp looked somewhat tender going offwind, rolling back and forth - not atypical for a cat-rigged boat, or maybe the skipper had dumped the water ballast for a quicker ride back home. Two photos of the Gig Harbor Boatworks Scamp from the Annapolis Sailboat Show. Plenty of room in this 12-footer! If I remember correctly the rep said they were building about 30 a year. Base price is $13,000 USD. The cabin is just a cuddy cabin, enough to shelter from the weather. Plenty of storage under the seats and up forward. Wooden Scamps being built from CNC kits. This photo gives a good idea of how the kit pieces fit together. 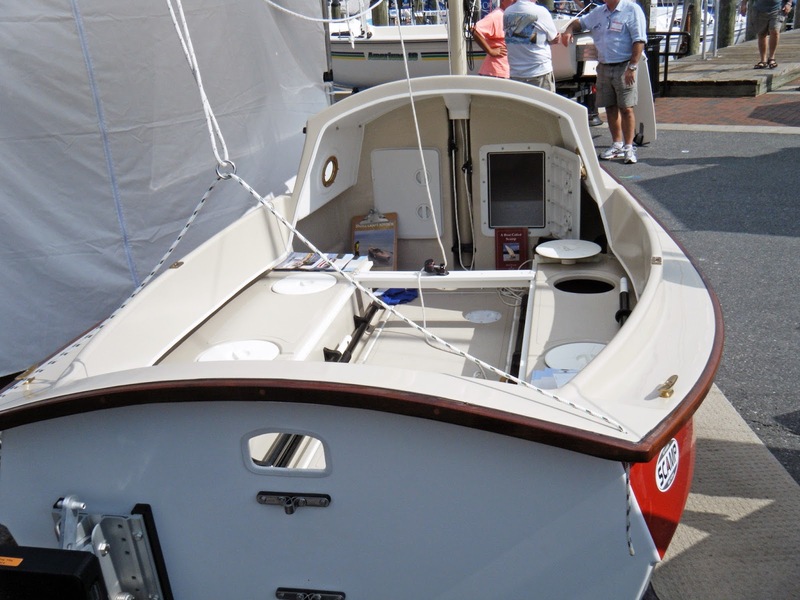 You can see in the lower Scamp the centerboard trunk incorporated into the starboard seat tank. A Gig Harbor Boats promotional video. 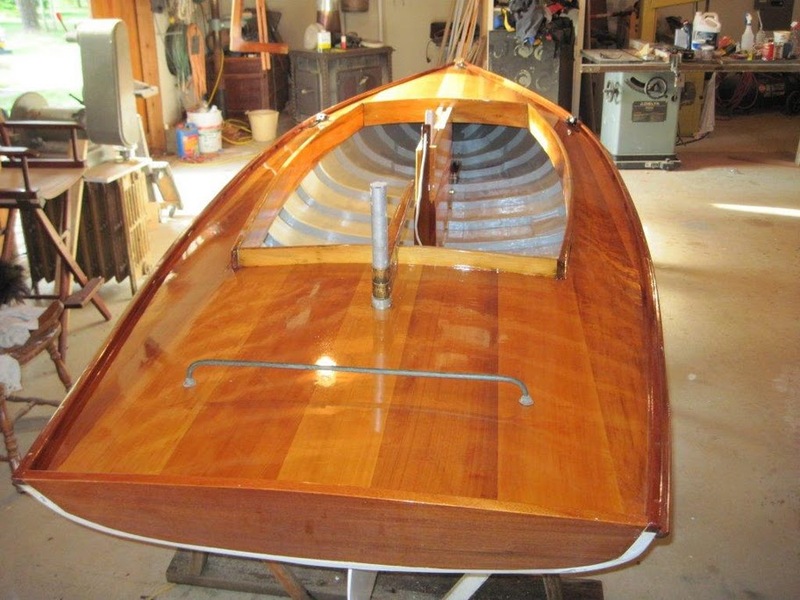 Also, over on my blog list is this duo building a 17' Devlin designed daysailor-cruiser. Ah! the yin and yang of this holiday season. I guess it is to be expected when Christianity decided to shoehorn their most important celebration into the same time frame as the pagan bacchanalia of Winter Solstice. Which brings me to Krampus. I first learned of Krampus by reading the back of a beer bottle, specifically the back of Southern Tiers Krampus brew (it is sometimes very informative to read the backs of beer bottles). Krampus was the draconian Austrian version of St. Nick's (Santa Claus's) enforcer - if you were a good girl or boy you received the beneficence of St. Nick - however, if you were bad girl or boy you were pursued to the ends of the earth by a horrific, horned creature, Krampus. The story varied as to the punishment meted out by Krampus - the worst was capture by Krampus, collection into a hamper borne on Krampus's back, and then whisked off, never to be seen again on this mortal earth. Wow! that is one over-the-top tale to scare the bejeezus out of the young'uns. "There seems to be little doubt as to his true identity for, in no other form is the full regalia of the Horned God of the Witches so well preserved." Here is actor Christoph Waltz (never seen Christoph in a movie - I don't watch many movies but Christoph was in a Tarantino movie which makes it even less likely - Tarantino movies have too much mindless blood, guts and gore for me) explaining Krampus on the Jimmy Fallon show. The Austrians have revived the tradition of Krampus. There is now a Krampuslauf - or Krampus Run (or in Americanese, the time when a drunk biker gang took over your town- sans bikes). In many alpine towns in Austria and Bavaria in early December men put on costumes of the various permutations of Krampus and transform into the nasty, scary Krampus persona, attacking parade spectators and giving young children nightmares weeks out. The New York Times did this video on the Krampuslauf, as well as highlighting the passion and skill of a wood carver who makes the wooden, gargoyle-like, Krampus masks. Wishing all of Earwigoagin's readers, happy holidays, happy Winter Solstice, or happy whatever way you celebrate the end of the year and the beginning of a new one. I just hope you've been just good enough to avoid a visit from Krampus this year. I received an inquiry; "How do you actually assemble the hull? 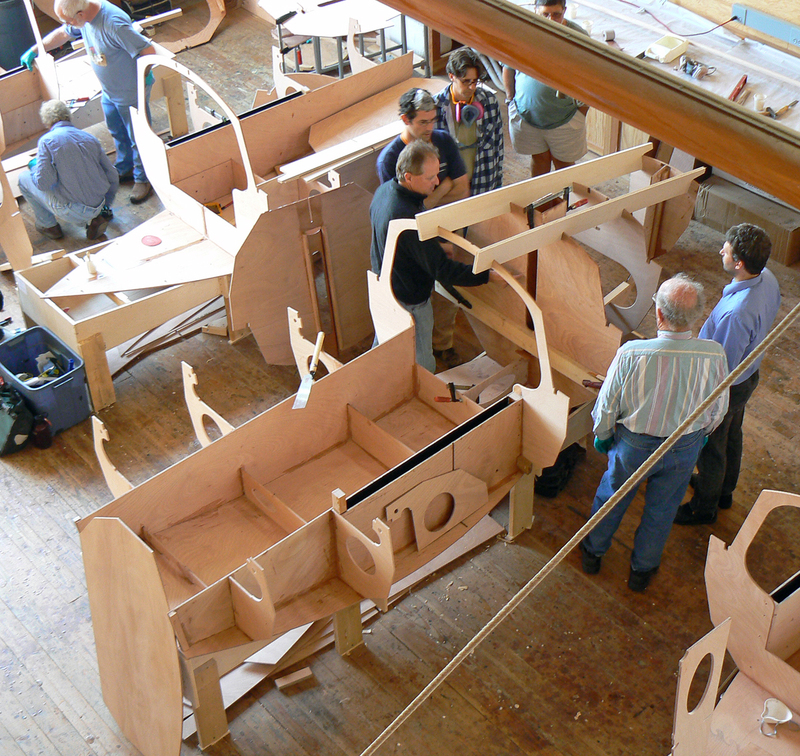 Again, I turned to master builder, John Z, and he supplied the following short PDF of photos and captions detailing at least the first assembly stages of a Mistral Classic Moth build project. I Threw My Drysuit Away! Last summer I took a look at my very old, seldom used dry suit and decided it was time to toss it. 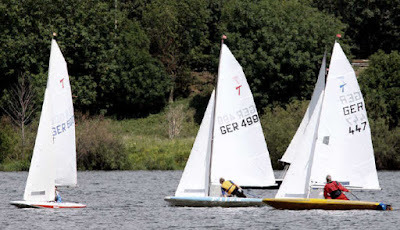 I haven't sailed frostbite in dinghies in decades and the rather laborious task of replacing dry-rotted seals just wasn't worth it. 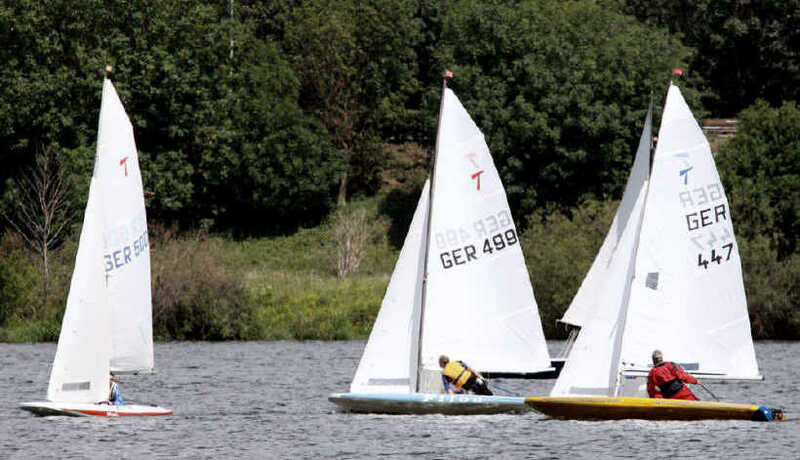 I guess I've reached the point where I'm quite happy watching other dinghy sailors sail in freezing water, even if I have to suffer being a very cold spectator myself. 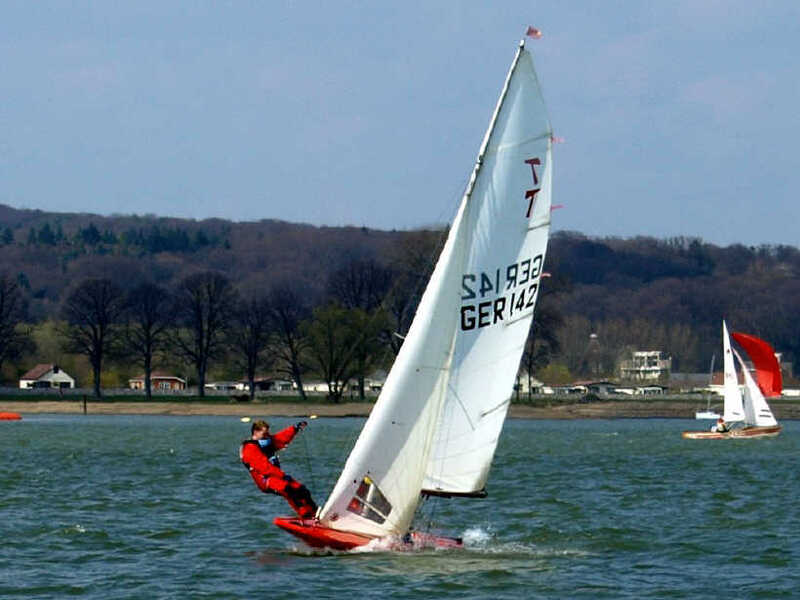 Here is a well done video of a cold, cold regatta, an intercollegiate regatta in 420's, shot in slow motion by a professional videographer, Doug Jensen. This video was shot in New England in March; a time when the air temperature may be on the way up but the water is still just a tad above freezing. Brrr! SONY PMW-F55 Center Scan Mode Testing -- Part 2 from Doug Jensen on Vimeo. Another 420 slow motion video in a post on Earwigoagin -plus some comments. Most likely this is racing at Larchmont Y.C; time frame between 1914 to 1918. A great video of San Francisco disabled sailors and their organization, a story told through their own words. Storytellers for Good: Bay Area Association of Disabled Sailors (updated version) from josh maddox on Vimeo. 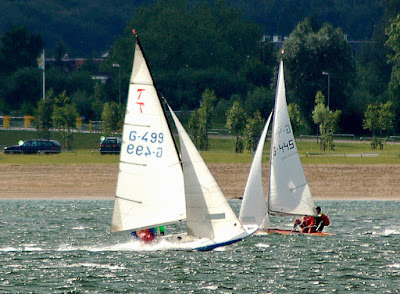 More posts about disabled sailing. The previous header photo was of two intent sailors on their SS Sloop, one of U.S.A's oldest dinghy classes. Designed by Benjamin Hallock of Moriches Bay, Long Island in 1908, he built 74 of them before he died in 1931. About fifty more SS Sloops were built after Hallock with at least one new build in the new millennium. Moriches Bay, on the south side of Long Island, normally has a consistent sea breeze in the afternoon and the SS Sloop sports a low slung gaff rig designed to be easily handled in strong breezes. 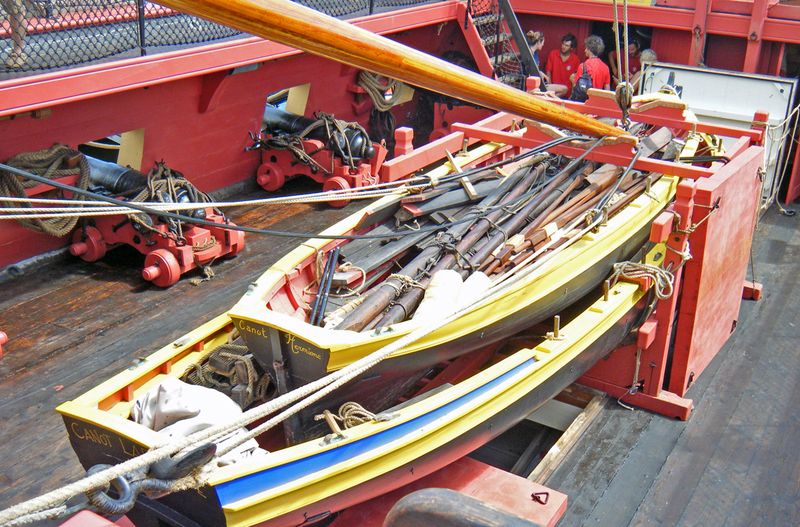 About thirty of the SS Sloop are still seaworthy and the centennial regatta in 2008 had a good turnout. 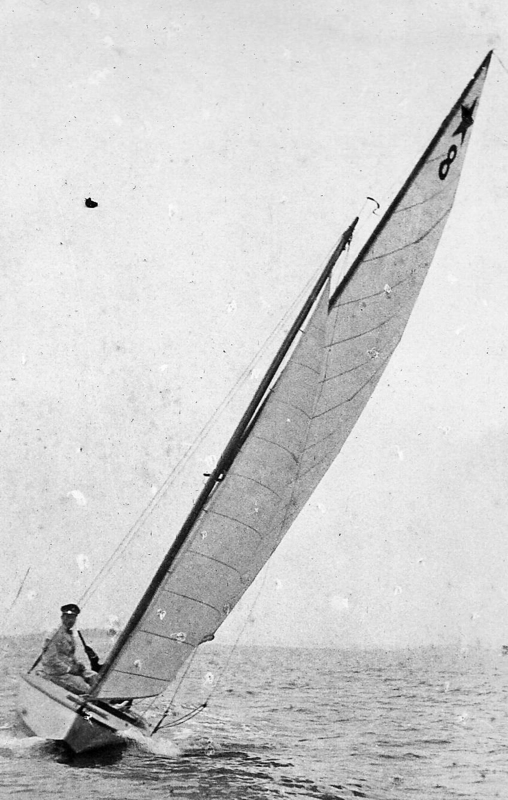 Hallock was known as a good builder of cat boats before he designed the SS Sloop. However, the flat sections and narrow beam of the SS Sloop show a lineage more towards the Seawanhaka racers rather than the fatter cat boats. 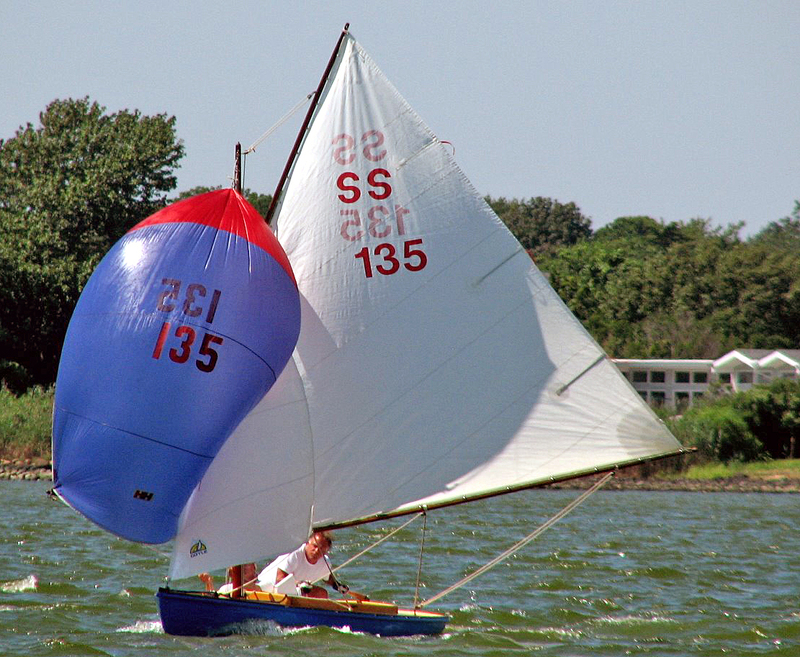 The SS Sloop has a small spinnaker which is set with both sheet and guy on the same side of the mast, not the usual arrangement for flying a spinnaker in modern sailboats. The 16.5' hull (5.03 meters) has a long enough cockpit for three. The rudder is set inboard. The gaff rig definitely has a low center of effort. A SS Sloop out of her natural habitat. This one is moored to a dock at Cayuga Lake, one of the finger lakes of upstate New York. 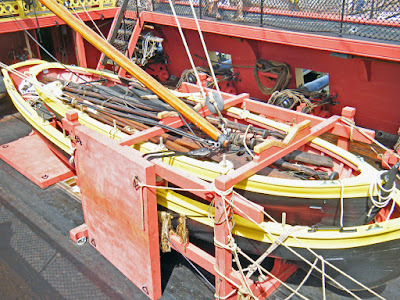 Will Haines writes a blog about the SS Sloop and also has a link to some PDF's of SS Sloop plans. Ah! Memories of teenage lust ..... for a boat. Around the age of 12, I learned to sail on an El Toro and shortly after, started to learn to race as a crew on an International 14. 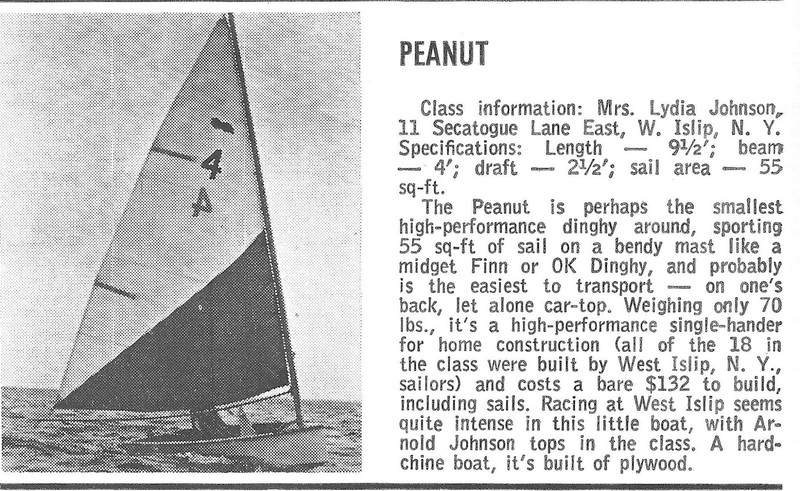 I became obsessed with sailing and, sometime in the 1960's, when the annual class review of the One-Design and Offshore Yachtsman came out, I spied this blurb on the Peanut class and fell in love. Slightly longer than my El Toro and much racier, I dreamed of owning this beauty. I sent away to the class secretary and got one or two mimeographed sheets with some grainy photos in the return post. I could have bought some plans but, I was, at that time, inept with the basic hand tools and my dad wasn't much better. The money I saved from my lawn cutting jobs was to be used for other purposes. 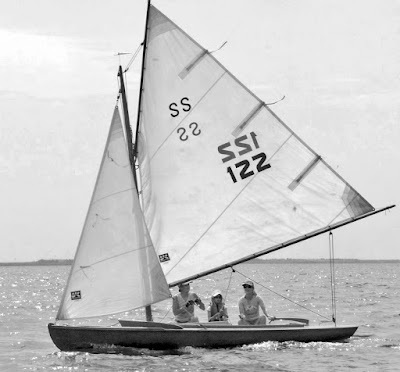 When I was in my twenties, in a short foray in the Finn dinghy, I sailed a regatta out of Sayville, New York, just up the road from the Peanut Class home port of West Islip. My teenage obsession had long passed and I never thought of making a quick 10 mile (16km) side-trip to see if I could find a Peanut dinghy in the flesh. In the ensuing years, despite inquiries to any Long Island sailor who has crossed my path, not one person has come forward as knowing anything of the the Peanut dinghy of West Islip, let alone have I been able to find a person who has seen one. It seems to be a class that appeared and disappeared very quickly, leaving not much trace. Addendum January 2019: An ad for a fiberglass Peanut from Yacht Racing, February 1072. Ed. Note: There is also a Norwegian Peanut sailing dink which was hot-molded and imported into the U.S during the 1960's - another instance of a class sharing a name. Music Whenever: Dave Rawlings Machine "Going to California"
A mesmerizing acoustic cover of the Led Zeppelin classic "Going to California". "Dave Rawlings Machine performs "Going To California" (By Led Zeppelin) live at the Georgia Theatre in Athens, Ga.
"Dave Rawlings Machine is comprised of Dave Rawlings, Gillian Welch, John Paul Jones (Led Zeppelin), Willie Watson (Old Crowe Medicine Show), and Paul Kowert (Punch Brothers).